To my Daddy – One of God's chosen Shepherds - One who has always had something magnificent to say. If you couldn’t reach deep enough inside to find something kind to say, you said nothing at all. I love the daddy that God built into you – always and forever in my heart. I will always remember and never forget that you prayed with each of us every night at bedtime – even in High School. Thus, I carried that same practice into my own children’s life and into my grandchildren’s life - when the opportunity is there. Generations have changed, but the memories that are framed with prayer – will never lose ground. Your slogan while we were growing up, “A family that prays together stays together” … remains a powerful truth to me today. Prayer has always been my tool to reach all the way to heaven and sit right down with Jesus – to rest my weary soul – to share a hurting heart – a disappointment - Or when I sought direction – safety – or just a helping hand. He remains my help mate – my spiritual covering, as I endure this earthly life without a husband. In this endurance, I often feel physically alone – but never ever really alone - For my God – and your God too, is always and forever with us, around us and within us. Prayer does change things – and although our family doesn’t look like it has ‘stayed’… through the test of time… it is my prayer – and I know it has always been yours too, that we will be together in our great Heavenly mansion one day in the sweet by and by – on that big homecoming day in the sky! So never ever stop praying, daddy. You have been given a great assignment in your old age. As you sit resting in your reclining chair, looking out your ‘prayer window’ to the world, think of us – and remember to pray. This generation - my children and grandchildren - your great grandchildren – need our united prayers. This nation needs our prayers. Families all over the world need God’s protective hand. We must not become slack in our assignment to Pray! May His will be done on earth as it is in Heaven – in all of our lives. Thank you for your spiritual influence – for your prayerful heart – your loving hands and gentle ways. Thank you for teaching us to play. Those acrobatic floor maneuvers and flying through the air with the greatest of ease – remains one of those memorable times when you took time for us. Your attitude towards serving others has given me my life purpose. And dare I not forget - your ability to ‘fix’ almost anything - with whatever happened to be lying around…has trickled down to me. Given the right ingredients and His wisdom to see a matter or a thing in a different light, I too have made some pretty enlightening discoveries. It makes me smile when the Lord uses simple things to perform magnificent solutions. He showed you first – before He could show me. You were my great mentor! And I – I am still your ‘cheerleader’! But the most influential thing – the One True thing – you’ve given me was indeed your love for the Lord. I too was born – was created in my mother’s womb – to love the Lord. As you have shared with me, even though I was the middle child, I was the first to be born into a ‘Christian family’. In fact, according to you, mama gave her life to Christ while carrying me in her womb – a few months before I was born . That means that I felt the Holy Spirit’s touch on mama – as He entered into her own spirit that night. In fact, that may explain why I have always felt His Presence around me – even as a small child – before I ever knew Him as my Holy Spirit. I felt His undeniable Presence – like a nail in a sure place. He - this Presence – this Quieting Spirit – this Comforting Spirit – this Safe Place – was always there for me. And now, I know Him personally! He is mine and I am His – His warrior bride forever more – just as He is and has always been for you too, daddy. I love you, daddy – first and foremost because you introduced me to the Big Daddy in the sky. He has become My Salvation! My Everything! He is the ‘I AM’ of …My Past – My Present – and My ‘Is to come’. Therefore, I have everything that I need. You, daddy, gave this little girl, the greatest ‘gift’ a Father could ever give to his child. Not only Love and acceptance – but you introduced me to your God – who has become my God, both now and forever more. 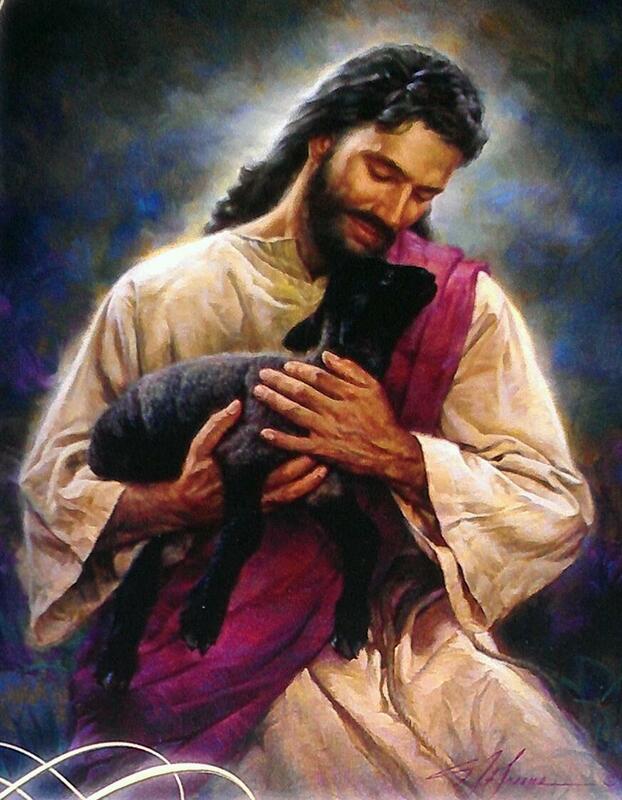 The Lord is my Shepherd, I shall not want for anything more. Blessed be the name of the Lord. His mercies endure forever and ever… AMEN! * a small tidbit of information - the hand that holds the pencil on my profile icon - is the hard-working hand of my preacher Daddy! Yes, it took many many shots before we accomplished just the 'write' pose. Sadly, he no longer remembers any such photo session. But I am reminded every day.... of how a man who couldn't read - was called by that great Big Daddy in the sky - to be His chosen preacher-man - how God chose him - a young man with dyslexia - who had never read a book in his life - to teach and preach the Gospel. And the first book he ever read was The Bible! And I will never forget how my Daddy painstakingly wrote - in longhand - all - and I mean all of his sermons for 40 + years. When God is part of the equation...magnificent things come to LIGHT! You can read more in my post - "When Grandmother Prayed"
I didn't know that your heart was so much with Mexico. I either missed that bit of info or forgot :) you have to share your heart with me in an e-mail. We could unite in prayer on the matter. "Prayer ...the real Sword to battle the battles..." I think many are too embarrassed to ask for prayer. I used to be. That was a pride thing. I didn't want to appear 'undone' :) but probably more than that...many are just plain lacking the experiential knowledge of the power of prayer. It takes time to trust a God that we can't see. It's a maturity process. But we have to enter into that prayerful trusting relationship in order to receive & experience the power behind prayer. You nailed it... it is the sword to battle the battles of life. I am so filled with comfort to know that the Holy Spirit is always interceding for us. He's always standing in the gap in our behalf. I just love knowing that! Jesus is our LIFESAVER and He sends His Holy Spirit to make sure we get to where we need to go. He never stops caring, does He? I love to photograph older hands too. They tell a story. I wish I had taken more poses of just daddy's hands. He was such a hard worker. I am wondering what is weighing so heavily on your mind. My mind is heavy with burdens right at this moment too. Life is hard at any age - regardless of the circumstance. What you said here weighs on my heart too "...to not be sucked in by evil that appears good.." It is all around us...in very clever disguise. We need eyes to see and ears to hear. I know you are busy with the move... but I'll send you my email and you can share when the time feels right to share more of what is on your heart - so we can raise our prayer swords towards the battle in one accord. What a beautiful and honoring tribute to your dad and to his (and your) heavenly Dad too. May God continue to move your heart of intercession and your gift of sharing with us how He moves you. I don't ever want to be just a noise. How beautiful it is for us to see a little bit more into your heart and spill the love you have for your earthly father and much more with our heavenly Father. I had to click on the picture in your profile and saw your dad's beautiful hands. I agree...that was a nice shot of his hands with that pencil. May God's strength and comfort always be with your father and same with you. I know it's not easy sometimes for us to see the needs (or even the declining health) with our aging parents. It is with great comfort and joy to know that if we are of the Lord's someday, there is no more pain. And that we will all be in His mansion. Forever. God bless. Thanks for picking up the pencil. So glad you liked my dad's hand. He is going to be 86. Is still an invalid and in great pain. We are taking the steps to place him on hospice. The back pain is overwhelming to him - and can't be fixed. I pray hospice can quiet his pain and thus quite his spirit. He has been ready for his heavenly home for the last few years. The dwindling is hard to accept. Thank you so much for your love and prayers. God bless you too. What peace I feel to be reading these beautiful words in tribute to your own earthy Father. It is a Sunday morning here, and I have left the leading to visit your blog, as I noticed on my sidebar that there is a new post I hadn't read yet. So glad I came by - what lovely, kind, gentle words these are. Yes you have been chosen even from your mother's womb, to be a woman after your Daddy's heart . Happy Father's Day to you, dear friend. thanks for picking up the pencil. You make me smile :) yes, I was chosen to be a woman after my daddy's heart - my earthly daddy and my big daddy in the sky. It is a daily choice to follow in their footsteps. May I follow so close behind my Savior that the dust of His sandals settles on my feet. Someday, our paths will meet - yours and mine - with Recubes, Sherry, Deb, and Cora... and all my other readers that know the Savior personally... we will meet in that great big homecoming in the sky. So looking forward to it, aren't you, my Kingdom friend. Just so beautiful! What a privilege to have a Daddy who loved the Lord, lived it, and passed it on to his children! And thank you for stopping by my blog and sending me a note. My card is ready to send off to your Dad! Thank you for giving me the privilege of doing that! What a blessing you are to me.... to many! Thank you for taking the time to pray for my daddy and for sending him God's chosen encouragement. God knew just how to encourage him. It had your name on it! I loved this Patrina, no surprise to you I'm sure. You and I are both middle children in a family with a preacher daddy. What stories... and like you, my greatest treasure and legacy from my own dad was the teaching of Jesus through his life. Love and a big hug to both you and your precious dad! Middle children have a hard time growing up, don't we? At least I did. I don't have as many stories to tell as you do. You are the master story teller :) Unfortunately, I got lost somewhere in the middle. But the Lord has been my guide and thankfully, I am now found! I've missed reading from you! Really miss your encouraging words. This is a beautiful tribute to your dad. You are very blessed to have Him in your life. This is more like my mother, she is the one who always insists on prayer, when we are home visiting, she would insist o holding hands ad praying together as a family. I tell you its those prayers that have seen each of us this far. I thank God for her. Missed you too Patricia. Thanks so much for visiting. So nice to see you. Ya know, we didn't hold hands to pray while I was growing up but I did with my own children. And the fun thing is...my grandkids now initiate when we're together for a a meal :) I just love it when you can see a family tradition passed up to the current and future generations. It is those prayers that have driven us on our journey towards a more intimate relationship with the Lord Jesus. Yes, this is the 'one thing' that is valued most - about my father, He taught me about my big daddy in the sky. I am most grateful. Will be visiting you soon. I haven't had internet for 2 months. Recently moved and trying to settle. No doubt when little else remains at the end of a life the communion with God remains, and the words from God that we do not know about. Thank you so much for your kind words. They brought me to tears. Dad is no longer the dad I knew. The transition from caring for him in my home to allowing someone else to handle his 24/7 care - has been hard for me. But probably harder for him. He has regressed - and I wonder sometimes where faith goes in old age. I've witnessed it still strong in many others - but I no longer see it in dad. It perplexes me. I am in constant prayer for his peace of mind. He appears to have none. Your words, "the communion with God remains"...gave me hope. It must be so. How can it not be so? ...and your words, "the words from God that we do not know about." I trust in the Lord Almighty's ability to get through to him in his quiet moments - when he ceases his war against life. Again, your words brought life to my soul. I have been praying that the Holy Spirit, which dad knew intimately in his years as a pastor...will fill his eyes and spirit with God's LIGHT. That the Holy Spirit will open his ears to hear his small still voice. Your words bore witness to my simple utterances to the Father of LIGHT. Your words were confirmation that God has dad 'covered'. Grace Grace...marvelous Grace... Grace that will pardon and cleanse within. Thank you so much for your spirit-led words ...concerning dad's lingering life. honored that you visited me with such profound words...just for me. loving the quotes you have on your blog. How blessed I was to hear from you...and to read your kind words. They were Heaven sent. A touch, a smile from God. A needed hug. Thank you for being His instrument in delivering His specific message to me. I am blessed that He chose YOU ! May He continue to speak to you...in ways that share His heart.